Last weekend Rob and I chatted through Skype.and the conversation turned to meat. Don’t be scared, this article will not be about vegetarianism. Not that anything is wrong with that, but Rob and I both can appreciate some good meat. But having said that we both also care about the well being of the animals. Rob told me that someone he knows very well (and sorry, I forgot the name of this lady) who gave him last year some meat from extreme good quality. Very clearly no bio-industry meat, but very well prepared meat and never has been frozen in before. Believe me, every time you deep freeze meat it loses some of its quality. Often meat from a supermarket has been frozen before you buy it. There are even stories going around that meat in a supermarket can be 2 years old (beware, I said “stories”. I have no idea how true these are). All in all, for me, enough reason not to buy any meat at a supermarket. For me it is very simple: Something that has been frozen, you never freeze again. Anyway, Rob really loved this high quality meat that he got last year and he has been looking for a way to buy it for himself. He found one organisation, but you had to collect the meat yourself and only throughout the week during office hours, this was not doable for him. But very recently he was pointed by someone to another organisation who sounded really good to him AND they deliver at home during two evenings in a week. This organisation is called “Koop een koe” (“Buy a cow”). People buy a part of a selected cow. 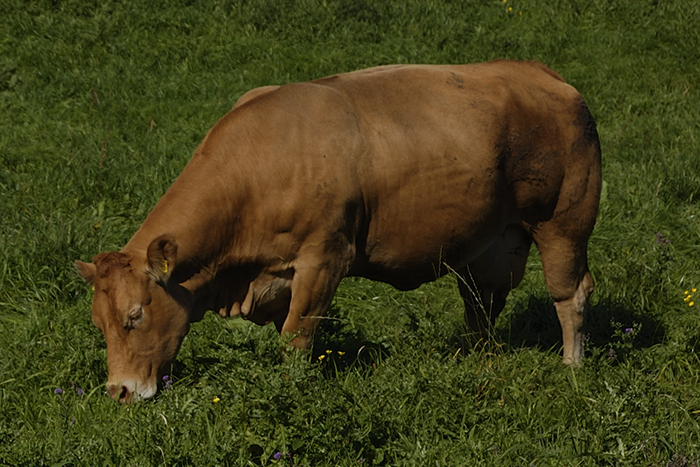 When the cow is “completely” sold, the animal will be slaughtered with as less stress as possible (which can be a lot less as in the common slaughterhouses). These cows are kept in a friendly way. When possible they can walk outside. The sheds are modern, clean and with lots of space. A calf can stay for 8 or 9 months with their mother, which benefits the health of both. No preventive antibiotics. No not needed medicines at all. The meat is really pure 100% beef. There are no E-numbers, sugar, colourings or preservatives used. Some people may not like the idea that you buy a cow that is still alive for its meat, but on the other side you know that this cow had a good life. When the meat is delivered is it all ready to be placed in the freezer (labelled and all). But I would like to advise to pick one piece of the meat and enjoy for once the wonderful taste of meat that never has been frozen before… it is worth it. The package meat is marked with an ear tag number, that is the cow’s ear tag, so the meat is always traceable. The thing is that Rob told me very excited about this organisation, but privately I already often buy my meat through “koopeenkoe.nl”. Apart from the well being of the animals, the meat is of superb quality. And for me, with my background, that is also very important. Interesting! I will have a try at this as well. I do love a good piece of meat, but I also care of the well being of the animals.